Wahay, a timely blog post! That’s a bit of a rarity around here these days! But I am so chuffed with this latest make that I can’t wait to show you. This post is being fuelled by the latest batch of Marcus’ homemade wine, so if I get a little rambly by the end of it, you know why! 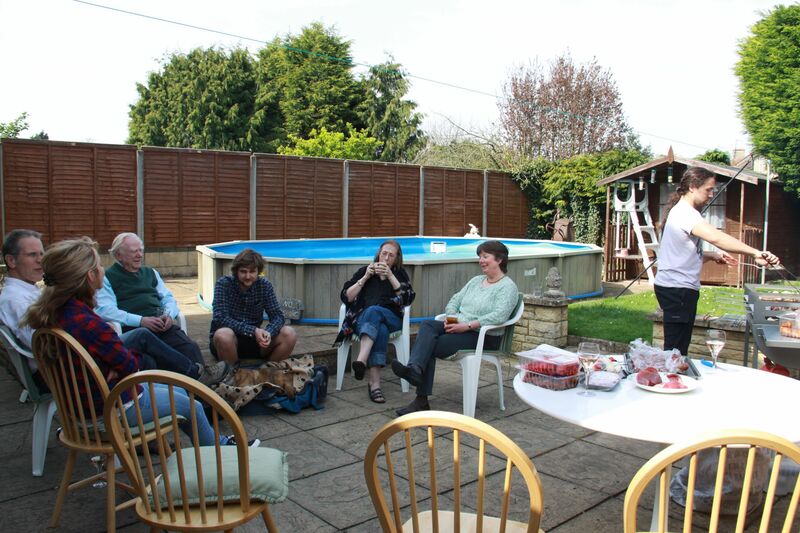 It’s my grandad’s 90th birthday on Wednesday, and he, my parents, my sister and her boyfriend all came up to visit us on Sunday. 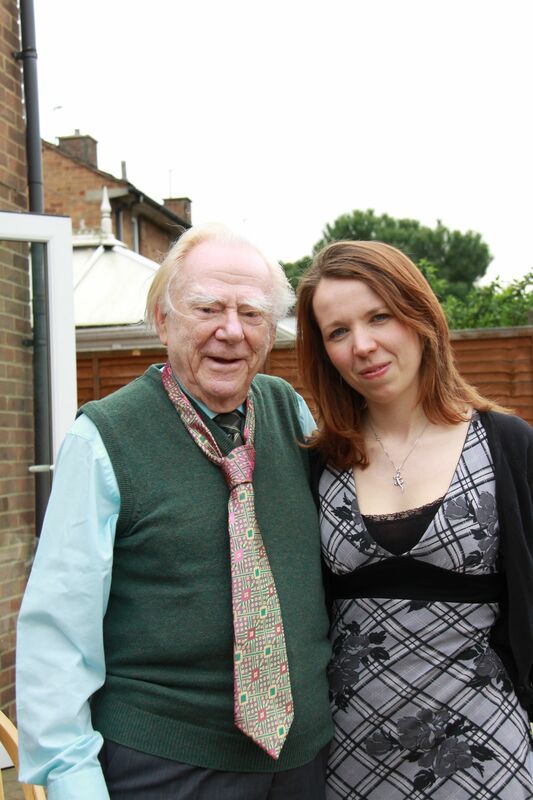 My sister and my grandad hadn’t yet seen the house (which my grandad was very excited about seeing, he did help me buy it…), and what with it being mothers’ day, and his birthday, we thought it would be a good excuse to all get together at our place. 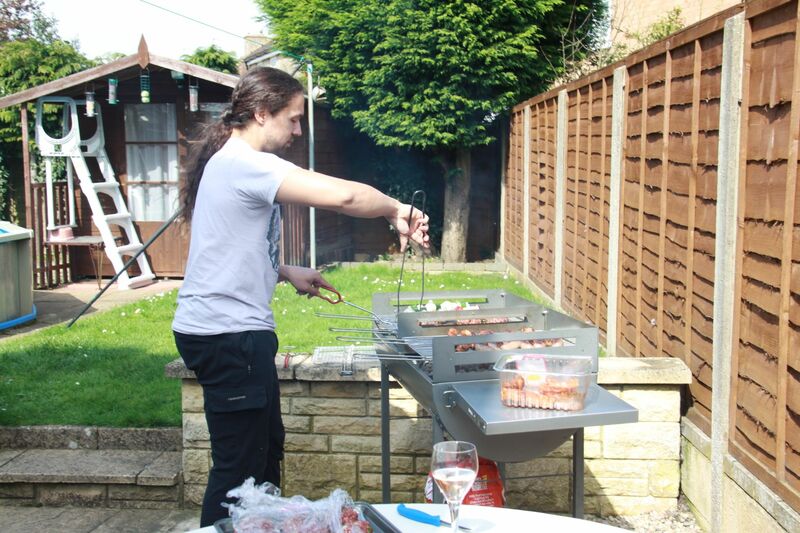 It was a lovely day, so we decided to have our first barbeque as well, and it all went down a storm. Marcus was the master of the BBQ and did an excellent job of keeping everyone well fed! Marcus’ mum came over and joined us as well, and it was the first time our parents had met, but that all went well too :) all in all, a very successful day! But it had got to Friday, and I didn’t have anything to give my grandad for his birthday. 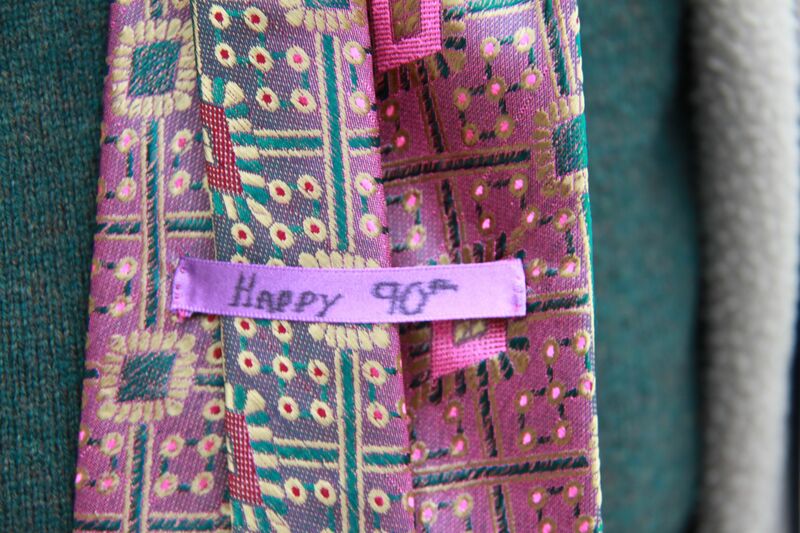 Not that he really expects anything much, but it’s his 90th, and getting to that age is quite an achievement, so I really wanted to mark the occasion. I wanted to make him something, to make it a bit more special, but I wasn’t entirely sure what. I made him some napkins for Christmas (still unblogged, see what I mean about timely blogging!) and wasn’t sure what else he would find useful. I was discussing this with my colleagues on Friday when one of them suggested that I make him a tie. This had, briefly, crossed my mind before, but for some reason didn’t stick. It was the obvious thing really – he almost always wears a tie, so I knew it would get used, and he takes great pleasure in wearing the one I gave him a couple of Christmases ago when he knows he is going to see me. I did a quick google, and came across this pattern from Puking Pastilles, which looked great. Although I wasn’t feeling well on Friday, and I had the browser window sitting open for a while, and every time I saw the title of the page, it made me feel very queasy! The pattern looked pretty straightforward, I was just hoping I could get it made in time given that I knew I was busy for pretty much all of Saturday. I also had the perfect fabric for it in my stash. I bought this fabric when I visited Goldhawk Road with Claire, Daniela and Jenny a few weeks ago. I bought the fabric to make a Zinnia skirt, and wanted 2.5m. But there was 4m left on the bolt and the shopkeeper refused to sell me 2.5. It was £5 a metre and in the end we settled on me paying for 3.5m. But now it seems it was good fortune that I ended up buying more than I needed, as I don’t think I’d have had anything else at home that would have worked as well. The fabric is a Chinese brocade and it’s really silky, fairly thing, and has gorgeous colours that change in the light – it’s green from one direction and pink from another. It also frays like anything and is pretty delicate, so I tried not to handle it more than I had to. There were just three pattern pieces, and you need one of each in main fabric, lining fabric and lightweight interfacing. All of the pieces are cut on the bias, so choosing a pattern is quite important. The fact that it’s cut on the bias was the one thing that made this make a little tricky – the fabric pieces didn’t hold their shape very well once they were cut, and distorted a bit. I cut the main fabric first, and made sure to line up each of the edges of the pattern pieces along one of the diagonal lines on the fabric. Unfortunately, what I didn’t realise until after I’d cut it was that I actually cut the largest of the three pattern pieces on the bias in the other direction – the grainline arrow was on the crosswise grain rather than the straight grain. This means that the pattern runs in a different direction on this piece, but given that the join between this piece and the next is way up round your neck when you wear it, I figured it didn’t matter too much. I then cut out the lining, and the interfacing. It wasn’t until I was just cutting out the last piece of interfacing and wondering how, when the lining had distorted slightly from being on the bias, I was going to manage to iron the interfacing to the lining without getting it stuck to something, that I thought that it would have been much more sensible to iron a piece of interfacing onto the fabric before I cut the pieces out. Not only would that have saved my interfacing problem, but it would have saved my fabric from becoming misshapen, and I’d have only had to cut the pattern pieces out once. Lessons for next time! 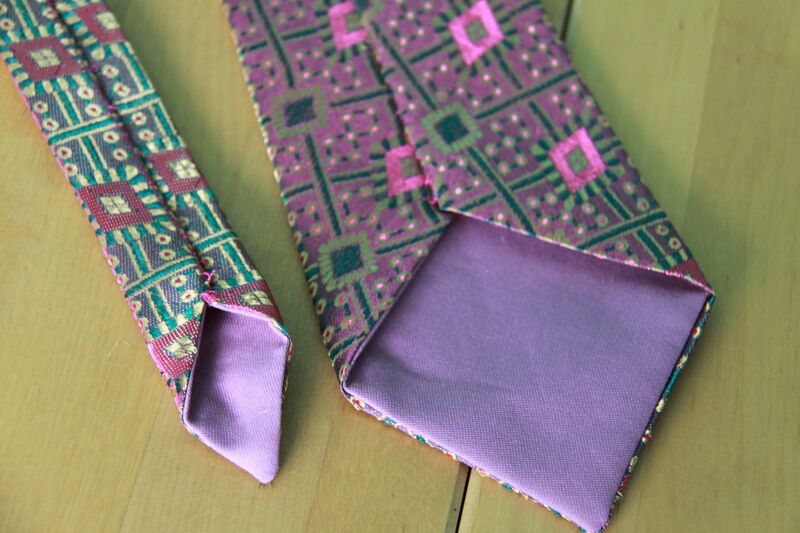 The tie is constructed by sewing each set of three pieces together, and then sewing the lining to the main fabric at the top and bottom edges. You then turn it right sides out and baste down the long edges, which you then fold in. Due to the now slightly different shapes of my fabric pieces, the basting as a little tricky. My middle pattern piece section ended up quite a bit narrower in one of the fabrics, so I was trying to guide the basting stitches in, while still keeping them in a vaguely straight line. After basting the second side, I realised that the main fabric wasn’t sitting flat, it was slightly off and had ripples in it. So I took out stitching down one of the sides, which took me FORTY MINUTES! To unpick one (admittedly pretty long) row of stitching! Seriously?! There must be a quicker way? Because my main fabric was pretty delicate, and because I didn’t want the edges to fray any more, as then I’d have to make the tie narrower, I had to go very carefully, but even so, that seems like an inordinate amount of time. It took me a whole 3 minutes to re-stitch it, and this time I managed (with a lot more pins) to get it lying flat. 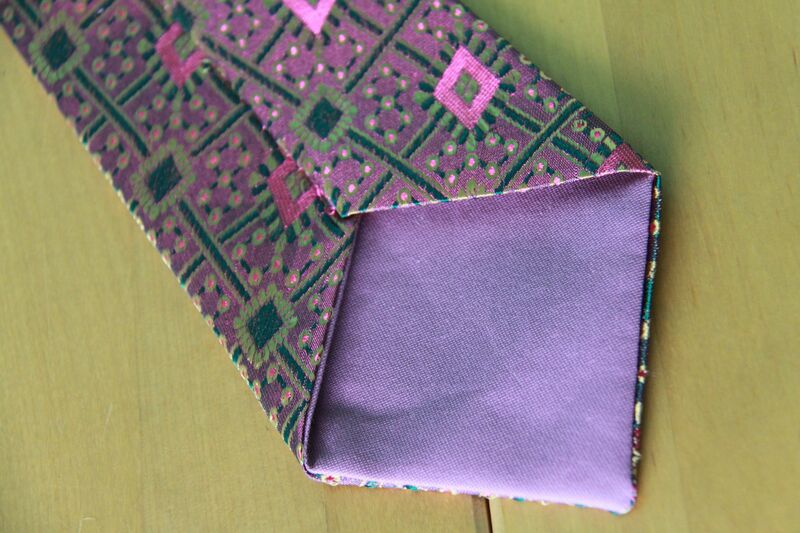 I then pressed over the edge of one of the sides, folded the other to the middle, laid the folded over edge over it, pressed it carefully, pinned it a lot, and then used a slipstitch to hand sew the back. So the tie, and the day were a roaring success. The sun shone, everyone approved the house, my parents were impressed with how tidy it was (and with fewer boxes) compared to last time they were here, and my grandad loved the tie and wore it for the rest of the day :) and if I look that good when I get to 90…well, I’ll be delighted! What a lovely post! 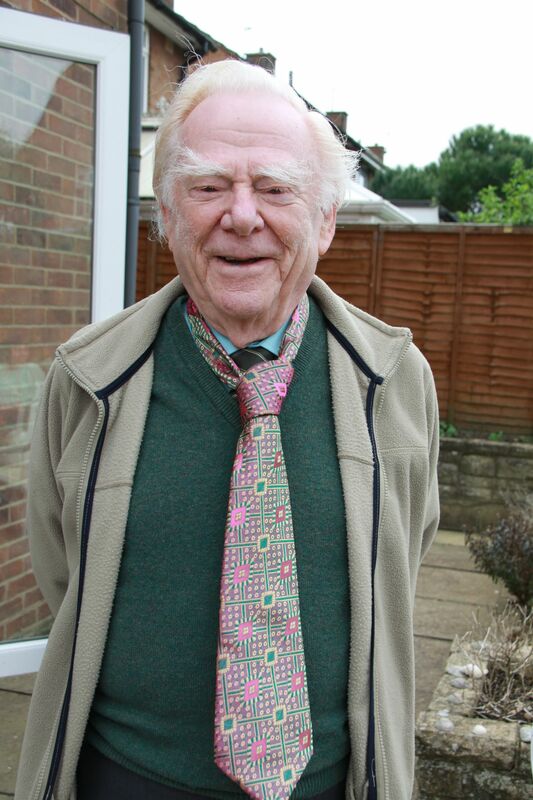 Your Granddad is so sweet and looks chuffed to bits with his cool new tie. Great job! Thanks Jenny! I’m really pleased that I managed to come up with something that was so good for him! 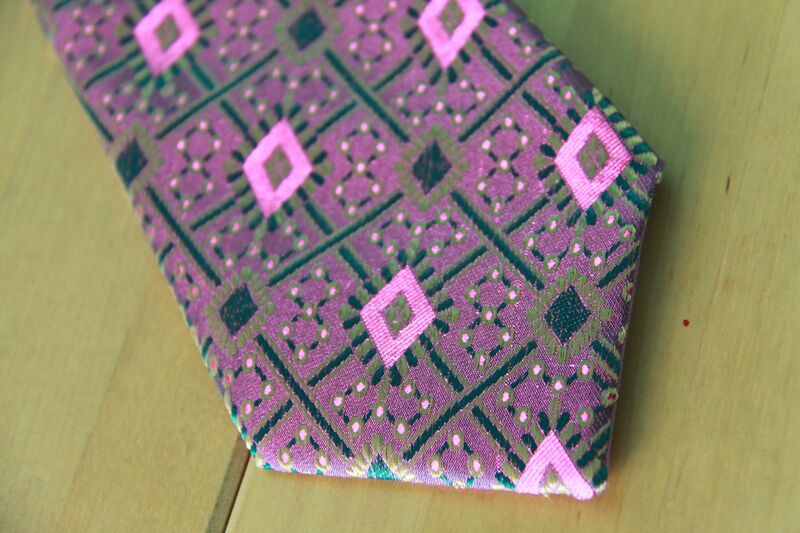 And that fabric was absolutely perfect for the tie – better than it is for the skirt in fact! Your granddad is adorable! I love the tie! I’m definitely going to borrow your suggestion to interface prior to cutting if I attempt anything like this! Thanks very much Michelle, he is pretty great :) yes, definitely interface before cutting, I’ve learnt my lesson! Ah! 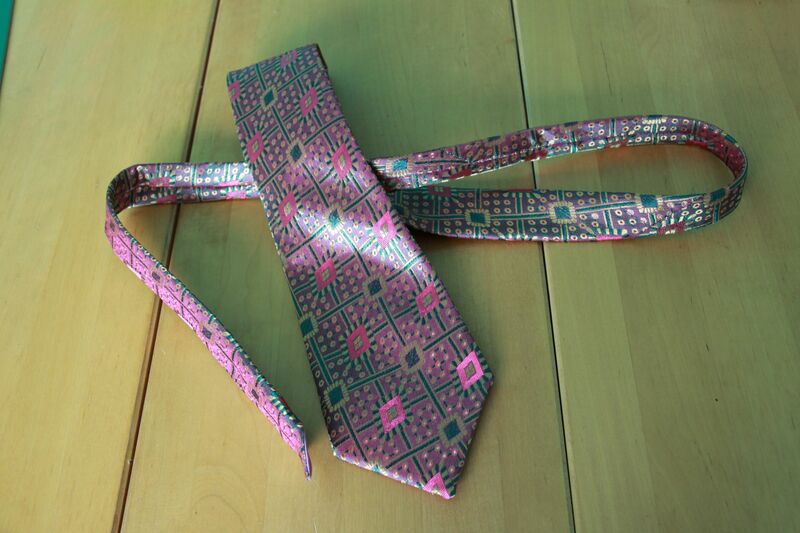 What a lovely tie, and a brilliant present! 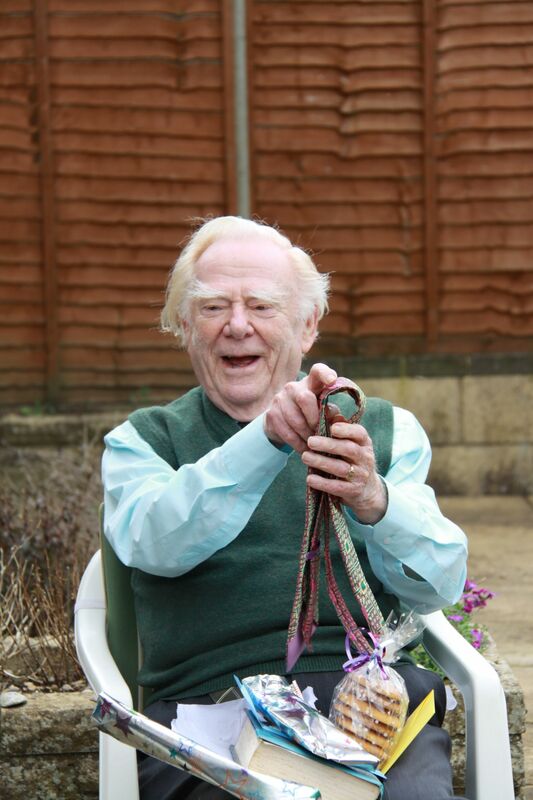 Your Grandad is a superstar, and I hope he has many more lovely birthdays. I always find thinking of gifts for grandparents really difficult too. Thanks Lynne :) I have informed him that he is a superstar! I hope so too – I’d better start coming up with more present ideas! That sounds like the best gift you could have given him. Thanks Emmely, I think he was really pleased with it. Aww, this is lovely. And your grandad’s a charmer! 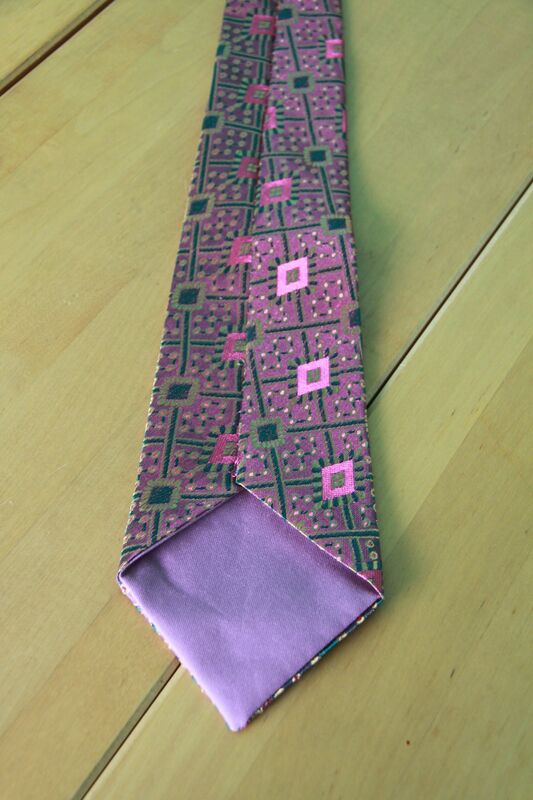 Well done on the tie too, it looks great. Hehe, he is rather :) thanks, i’m really pleased with how well it turned out! Is this your Grandfather on Facebook (claiming he’s only 70 and sharing concerns about immigrants in Birmingham) or has someone stolen your pics? Someone has indeed stolen my photos, thank you for bringing it to my attention.